When anyone mentions they are going to visit Orlando, Florida most people automatically think of Disney. 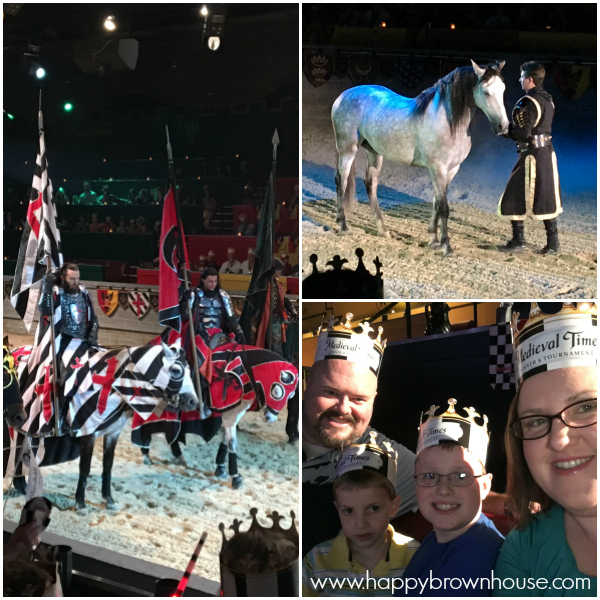 While I admit most of our time in the past has been spent at Disney when visiting Orlando, this summer we spent some time experiencing the other great things Orlando has to offer. Most of the time my kids see the billboards on the way to Orlando and ask to go there, but we’re always so busy on our Disney trips that we never get a chance to go to those other places. So, before we went to Disney we went down to Orlando, Florida a few days early to go to some of those places on the billboards and a few others that aren’t on the billboards. The Orlando area has so much to do outside of Disney! We had a blast and packed a lot into just a few days before heading over to Disney. Full disclosure: I received discounts and free items in this list, but all opinions are mine and I was not required to post a positive review. The perfect place to stay is the Lake Buena Vista Resort Village and Spa. I can’t say enough good things about this place! It is beautiful and their two-bedroom suites have all the amenities and comforts of home–a living room/dining room space, a kitchen, and a washer and dryer. 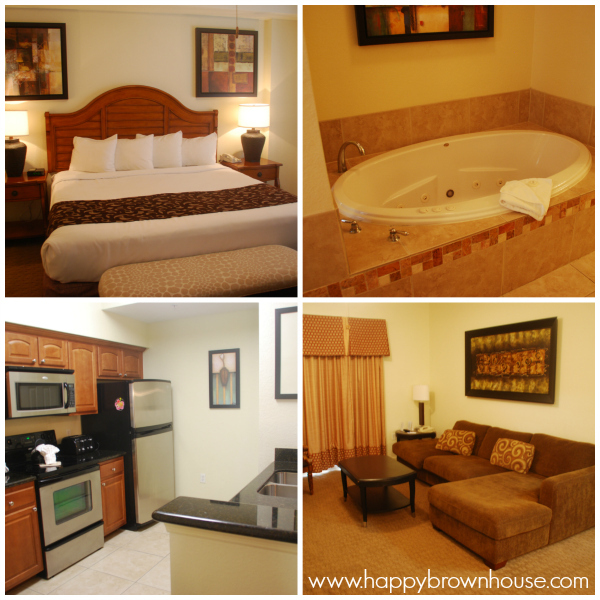 Plus, the bonus features of these suites are the large jetted tub and the gigantic shower in the master bedroom. This resort was the perfect place for us to set up camp for a few days and enjoy Orlando before we went to Disney. 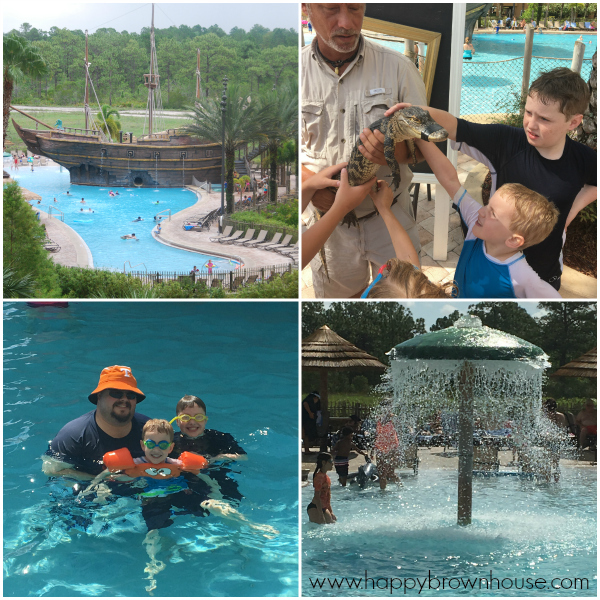 From the fabulous pirate themed pool to the gorgeous suite, we loved every minute of our stay at Lake Buena Vista Resort Village and Spa. While there, I had a relaxing massage that started our vacation off in the perfect way. (I’m pretty sure every vacation should start with a massage from now on.) An added note: if you were going to visit Disney, but didn’t want to stay on Disney property, this hotel is in close proximity and offers a shuttle service to the Disney Parks. It would be great for those going to Disney for a day and then going to other Orlando attractions like Universal Studios or Sea World. We used Visit Orlando to help us plan our trip and they were a wealth of knowledge. They’ve really put together a great website that highlights all that Orlando has to offer travelers. 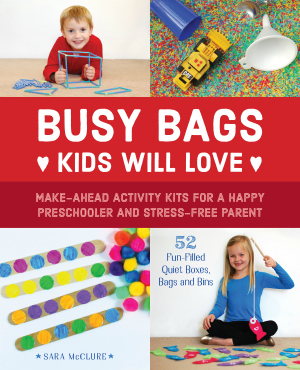 There was so much that we wanted to do, but ran out of time to do them! The Crayola Experience is a really neat way to spend an afternoon in Orlando. It would be perfect for those rainy afternoons that Florida is known for. 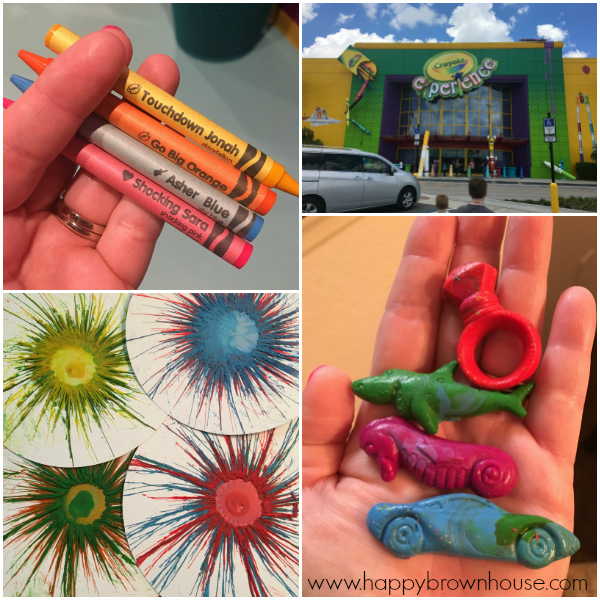 The Crayola Experience offers some really fun things like naming and wrapping your own crayon, melted crayon spin art, and melting a crayon into a mold so you have a shaped crayon. My boys really loved going here…and so did the adults! 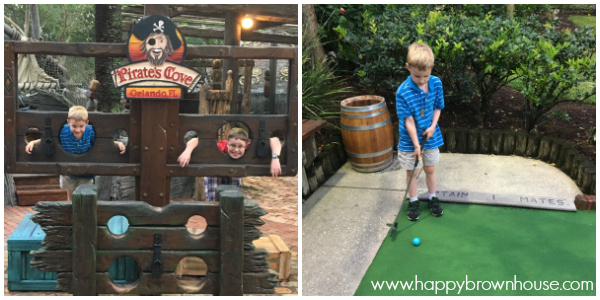 Pirate’s Cove Adventure Golf is a super fun pirate-themed mini golf. The landscaping is beautiful and the course is fun. There were a few times we had to be super careful not to lose our golf balls in the water, but it was a great after dinner evening activity for our family. There are two locations in the Orlando area. One location is super close to the Lake Buena Vista Resort Village and Spa that we stayed at during our visit. 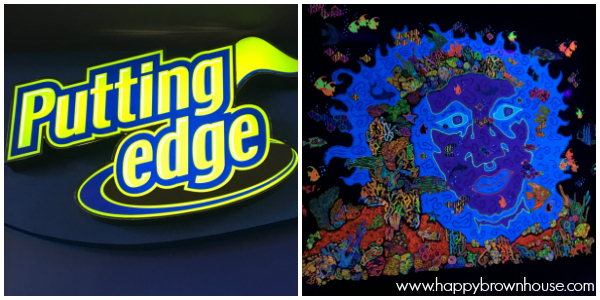 I know I just mentioned another putt-putt place to go to, but Putting Edge is so unique…it’s glow-in-the-dark! An added feature of this place is that it is indoors and air conditioned. That adds extra points in my book! It was a fun experience to play mini golf with glow-in-the-dark golf balls and see our clothing glow. I thought it was funny that even my bright pink nail polish was glowing. This indoor putt-putt course would be perfect for a rainy afternoon or even just a way to escape the heat in Orlando, Florida. While Wonderworks was probably my least favorite place because it was so crowded, my kids loved it! 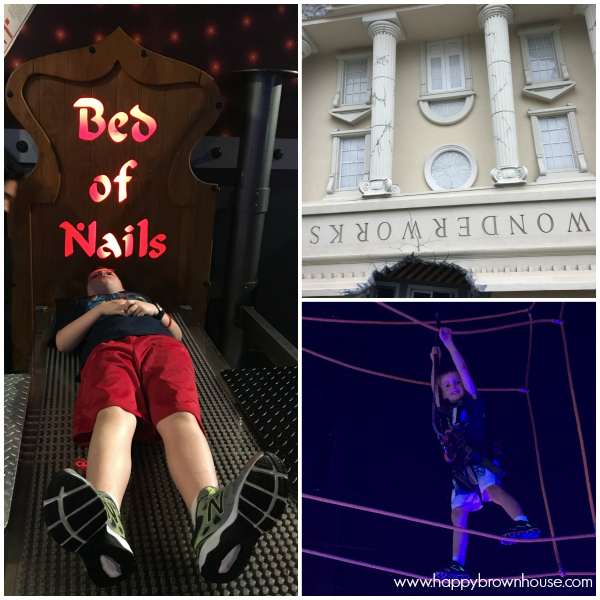 Wonderworks has lots of really neat things to look at and do. It’s one big interactive fun museum. We stood inside a hurricane simulator, laid on a bed of nails, played with giant bubbles, and more. Wonderworks in Orlando, Florida even has a ropes course and laser tag. I embraced my fear of heights and edges to chaperone my youngest that needed an adult to go up on the ropes course. My husband got some not-so-flattering pictures and video of me attempting to hold it together for my son on the ropes course. We went while it was raining, so it was perfect for doing something when we couldn’t be outside. 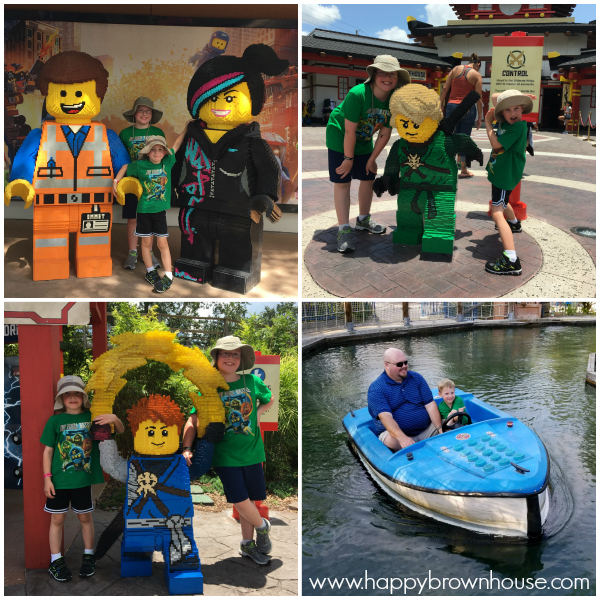 Ok, so Legoland isn’t in Orlando, BUT it is close enough that you could drive there and spend the day if you have any lego obsessed kids like we do. We made sure not to miss this. My boys were excited about the new Ninjago area and loved taking pictures with their favorite characters made out of bricks. I like Legoland because my kids can ride most of the rides without an adult. They love this little bit of independence. My boys also love walking through Miniland and seeing places like the White House made out of lego bricks. We also made sure to go to the waterpark to help us cool off after walking around Legoland in the Florida heat. My kids could play on the “Joker Soaker” for hours. Since we were there for only a few days before our big trip to Disney, we ran out of time to do everything we wanted. 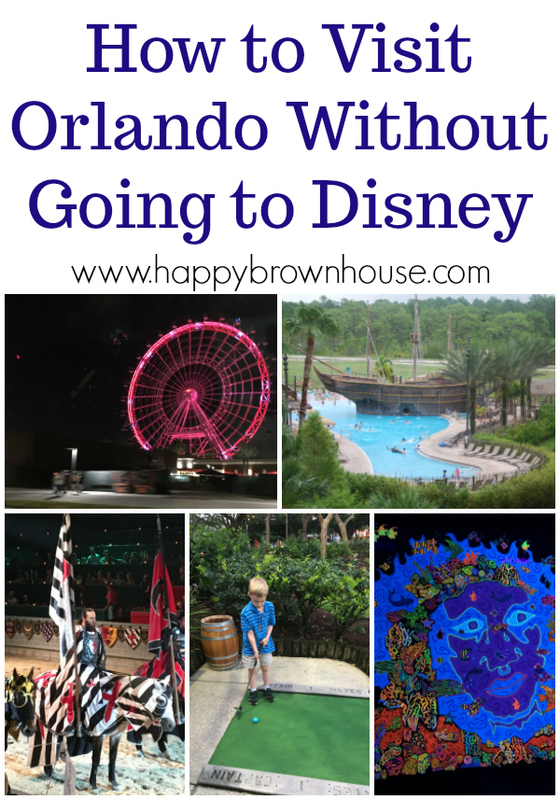 Orlando truly has so much to do that you can’t get to it all! Here’s a list of places that we wanted to go to, but we ran out of time for. Gatorland looks like a fun place to go to to see Florida alligators. My boys would’ve loved this place. Universal Studios is one of the theme parks that we want to take our kids to when they get a little bit older and can ride all of the rides. My rollercoaster lovin’ boy isn’t quite tall enough yet. Sea World is one of the places my kids always ask to go to when they see the the billboards. 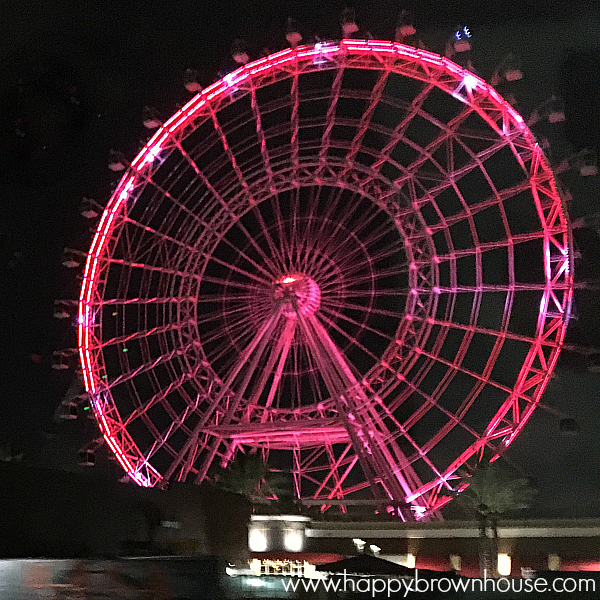 The Orlando Eye looks like a fun way to see Orlando from a different point of view. This giant ferris wheel was lit up at night and I snapped a picture from our van. If you’re planning a trip to Orlando, Florida, be sure to use Visit Orlando to help you plan your trip. They can flood you with ideas and places to go while visiting Orlando. We had a great vacation because of them!